Pham Nhat Vuong became a billionaire selling a Ukrainian instant-noodle business (front to launder money for Vietnamese communist officials before getting normalized with the U.S.) and creating Vietnam’s biggest property developer. The 44-year-old chairman of Vingroup Joint-Stock Co. (VIC), which is building eight mixed-use projects in prime locations in Vietnam at a total cost of more than $4 billion, plans to get even richer selling high- and mid-end apartments to Asians who want to reallocate their holdings from cash and gold. 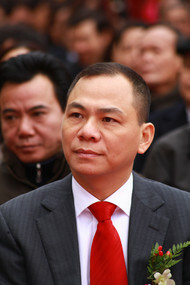 Vuong and his wife, Pham Thu Huong, own about 50 percent of Vingroup, Vietnam’s fifth-biggest company by market value. Excluding shares he has pledged as collateral to finance some of the company’s real estate projects, Vuong is worth $1.3 billion, according to the Bloomberg Billionaires Index. He has never appeared on an international wealth ranking. Vingroup is seeking to raise about $300 million in a share sale in Singapore by August to fund its Vietnamese expansion. The company shelved plans for a Singapore listing last year when the city-state’s benchmark Straits Times Index (FSSTI) fell 17 percent. The billionaire said he also has plans to build properties in Singapore or Hong Kong, where some of Asia’s biggest developers are based. Vuong studied geological economic engineering at Moscow Geology University in Russia. After school, he moved to Ukraine, where he created LLC Technocom, a producer of more than 100 dehydrated food products, including instant noodles and mashed potatoes. He sold the company for an undisclosed price to Nestle SA in 2010. Technocom had revenue of more than $100 million at the time of the sale. Based on the average revenue multiple of mergers and acquisitions involving food companies worldwide in 2010, the company could have been valued at $150 million when the billionaire sold the operation to the Vevey, Switzerland- based food company that year, according to data compiled by Bloomberg. Vuong declined to comment on the sale price because of a confidentiality agreement. Vuong returned to live in Vietnam in 2001, when he started resort developer Vinpearl Joint-Stock Co. He set up Vincom Joint-Stock Co., which develops mid- to high-end commercial and residential properties, the following year. Vinpearl and Vincom, both of which were listed, merged to form Vingroup this year. Vingroup has controlling interests in 18 mixed-use and resort projects it is building in Vietnam, including in Hanoi, Ho Chi Minh City, Hung Yen and Da Nang. It opened shopping mall Vincom Center A Ho Chi Minh City, which houses luxury names including Hermes and Christian Dior, in the commercial capital earlier this month. Its effective interest in the projects it is building is about 93 square kilometers as of Sept. 30. Vingroup’s projects in Hanoi, known for its French colonial architecture and tree-lined boulevards, are within 10 kilometers of the city center. The government, which created a market economy with Doi Moi, or economic renovation policies, in 1986, is seeking to develop the capital into a modern metropolis. At the mixed-use Royal City project, situated at an old factory site about 5 kilometers from Hanoi’s central business district, construction continues around the clock. Buyers of the high-end apartments, which are being sold at $1,800 to $2,500 a square meter, can adapt the design of their units to suit their “fengshui,” or Chinese geomancy, needs. The project will include the first indoor water park and ice-skating rink in Vietnam when completed next year. At Times City, located in a bustling residential and commercial area in Hanoi, Vingroup opened Vietnam’s first hospital that offers single-patient rooms and presidential suites. The project, scheduled to be completed in 2014, also includes residential blocks, a mall and an international school. Vuong, a father of three, said he wants to sell a new “living experience” for Vietnamese people. Vingroup has acquired land from factories that are relocating from central districts to the outskirts of the city as the capital pushes through its urban renewal plan. The company owns about 10,200 hectares of land in prime locations in Hanoi, the southern commercial capital of Ho Chi Minh City, as well as the coastal cities of Nha Trang, Da Nang and Hai Phong. Buying land in prime or unique locations has enabled Vingroup to sell its properties at a premium to market rates, even during a downturn, said Phuong Ton, an analyst at Viet Capital Securities in Ho Chi Minh City, who has a “hold” recommendation on the stock. Another key selling point is the developer’s ability to complete its projects within a short period of time, she said. The company sold $300 million of convertible bonds to international investors this year. It raised $100 million in the first overseas convertible bond sale by a Vietnamese company in 2009. Vingroup had assets of about $1.7 billion and liabilities of $1.3 billion as of Dec. 31, according to data compiled by Bloomberg. The billionaire said he will develop properties outside of Vietnam “when there’s a good opportunity.” He hired McKinsey & Co. this year to conduct a strategic review of Vingroup’s business and advise the company on its future. “Given their vision, limiting themselves to Vietnam’s boundaries would limit their growth potential,” Viet Capital Securities’ Ton said. Vuong travels to other cities for ideas. When the developer was building the Vincom Center in Ho Chi Minh City, he organized a trip to Singapore for the complex’s retail tenants, paying for their airfare and accommodation. They went to Ion Orchard, jointly owned by Singapore-based CapitaLand Ltd. and Hong Kong’s Sun Hung Kai Properties Ltd., to study its shop front and other features of the luxury shopping mall. Before building Vinpearl Resort Nha Trang, his first hospitality project, nestled on a private beach by the South China Sea, Vuong visited the hotels in Phuket with a screwdriver stashed in his suitcase. He used the tool to dismantle hotel room fittings — before reassembling them — to understand how they were put together. The size of Vuong’s target customers is unclear. Vietnam’s urban population is growing 3.4 percent annually, according to the World Bank, with growth fastest in and around the two biggest cities, Ho Chi Minh City and Hanoi. Only about 5 percent of the population in the two largest cities is able to afford homes currently being produced by large developers, according to the lender. About 47 percent of households in Hanoi and Ho Chi Minh City earn an average annual income of $7,425, according to property broker CBRE Group Inc.’s local unit, which said it would take 51 years to save enough money to buy a mid-end condominium that would cost $72,000. The majority of real estate purchases in Vietnam are still made without a mortgage. It would take the average household 242 years to save enough to buy a $342,000 luxury condominium, according to CBRE’s local unit. 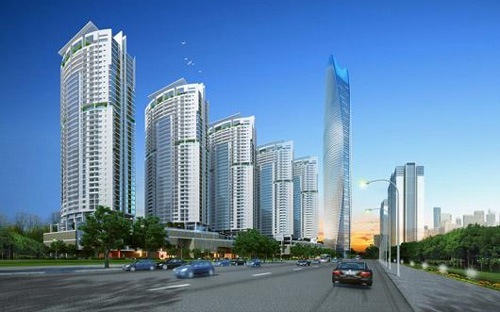 Home prices in Ho Chi Minh City surged almost threefold from 2004 to the first quarter of 2008, according to CBRE data. Values then fell as the government raised interest rates and restricted lending for real estate and other non-productive sectors, in a bid to tackle inflation. The State Bank of Vietnam has lowered its key refinance rate by 500 basis points since March to 10 percent, as annual inflation plunged back toward single digits from a high of 23 percent in August last year. Vingroup sold 7,000 to 8,000 residential units at the end of 2010 and early 2011, Vuong said. The apartment units at the Vincom Center in Ho Chi Minh City, which also boasts a spa and fitness center, were sold in 2010 at an average selling price of about $8,000 per square meter, a record in Vietnam. The billionaire plays soccer and basketball every week with Vingroup employees at the company’s sports center, often trading his suit and tie for a company soccer team’s red jersey and shorts. He plays the position of striker, whose job is to score goals. “Attacking is better than defending,” he said, adding that he applies that principle to everything he does. When you go to Ukraine, it is better not to stay in a hotel, but rent an apartment. It is more cheap, convenient and comfortable. There is a directory of Ukrainian apartments rent services http://ukraine-vacation-guide.com/dir/apartments/6 you can choose and book an appropriate accommodation in advance. I hope, you will like this wonderful country!